Going through a tough time? Have an immediate crisis? Need help with an ongoing mental health concern? Get help today with Student Counseling Services (SCS) by making a live appointment for a screening or reviewing our self-help guides or online resources. For emergency assistance after office hours, please contact your RD or call the LUPD emergency line at (434) 592-3911. Contact us to schedule your initial live screening appointment. Upon being scheduled for an initial live assessment, you will be asked to sign up on our Client Portal powered by TheraNest. This secure, HIPAA-compliant software allows you to review our consent form, complete an assessment document, and view upcoming appointments. Because mental health is a key part of your overall well-being, it’s good to find out if you should connect with a mental health professional. A brief screening is the quickest way to do this. This is completely anonymous and confidential. Immediately following the brief screening questionnaire, you’ll see your results, recommendations, and key resources. During your initial live appointment, you will be asked several questions that will help us determine the most appropriate care for you. We use the STEPPED Model (adapted from Calvin College, J. Broene Center for Counseling and Wellness) to determine your care. 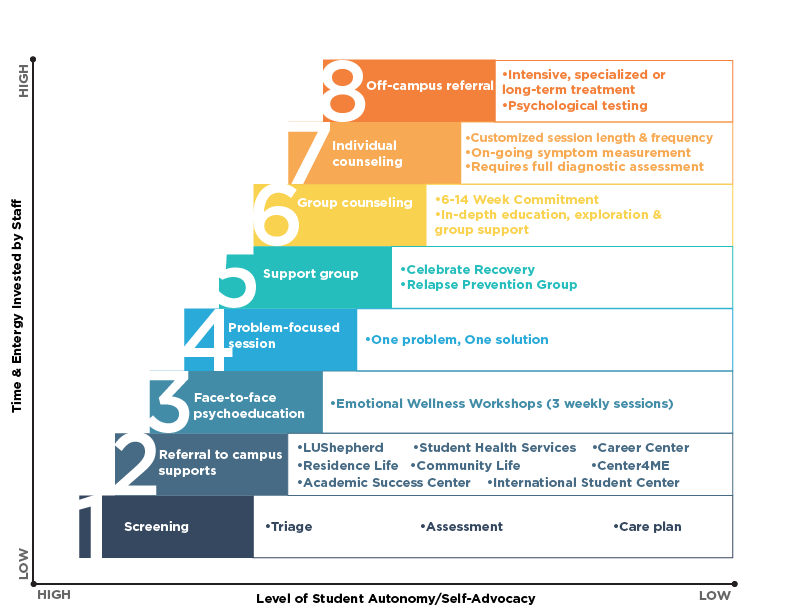 Most students are referred initially to an Emotional Wellness Workshop. Recommendations will be shared with you at the close of the session. For more information about our services, please view our Mental Health Services Policy Guidelines for Students. Campus Support, such as LU Shepherd, Academic Success Center, Career Center, etc. See what other students have to say about our counseling services. Student Counseling Services (SCS) employees/interns are entrusted with maintaining the confidentiality of those students seeking services at SCS. SCS is responsible for the confidentiality of student counseling and educational records. In accordance with the Family Educational Rights and Privacy Act of 1974 (FERPA) and Health Insurance Portability and Accountability Act (HIPPA), the counseling and educational record of each student is considered confidential. SCS is responsible for declaring, implementing, and enforcing policies regarding the access to counseling and educational records. For more information about confidentiality, please review our Confidentiality Policy. Our schedule is modified during summer months and semester breaks.